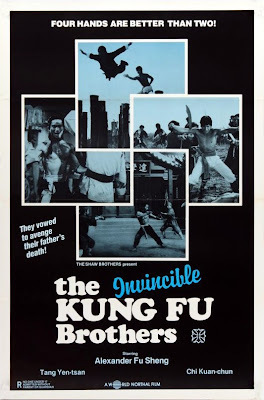 My interest in the World Northal Corporation began on February 20th, 1982, when I saw my first Shaw Brothers kung fu movie, TEN TIGERS OF KWANGTUNG, on WNEW’s “Drive-In Movie.” I didn't know it then, but TEN TIGERS OF KWANGTUNG -- which had been released to theaters the previous August -- was one of the 13 movies that formed World Northal's first trendsetting "Black Belt Theater" TV syndication package. 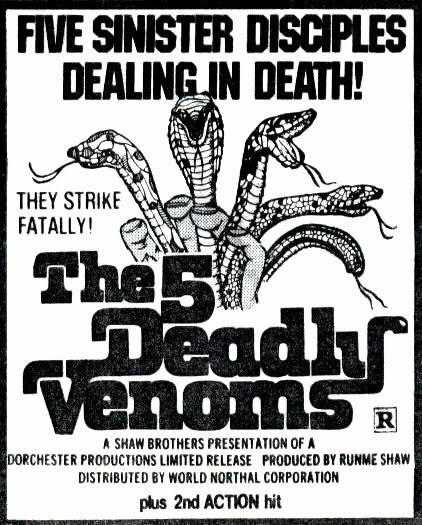 A few years ago I wrote an article about the company for George Reis’ excellent DVD Drive-In, and although subsequent research has revealed a couple of errors in the piece (including one that is now on the IMDb, and I’ll take full responsibility for correcting), it’s otherwise very thorough and includes quotes from a brief interview I did with former company head Mel Maron. 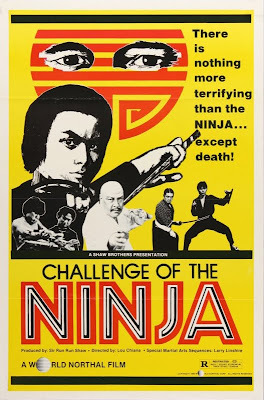 For anyone unfamiliar with World Northal and its “Black Belt Theater” packages, I highly recommend reading that article before continuing with this post. 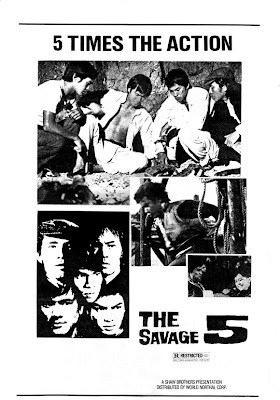 Like most of the independent distribution companies that handled imported martial arts movies (New Line, Aquarius, 21st Century, Transcontinental), World Northal was based in Manhattan, so the nationwide release “track” for their product began in the Times Square-42nd Street area, with additional playdates in the outer boroughs. After its New York debut, it might take weeks or even months for a movie like THE MASTER KILLER to reach other theaters on the track, such as the Colonial in Hartford, the McVickers in Chicago, the Capital in Philadelphia, and the Rialto in Atlanta. After a year on the track, the World Northal releases would be edited for time and content (by Larry Bensky) and sold to TV in the company’s successful syndication packages. 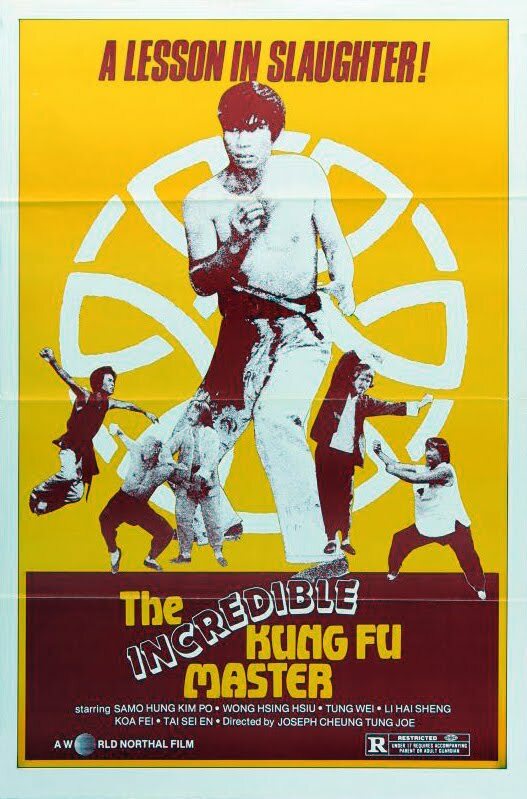 There are three sources responsible for the inaccuracies on the IMDb related to World Northal's kung fu releases. 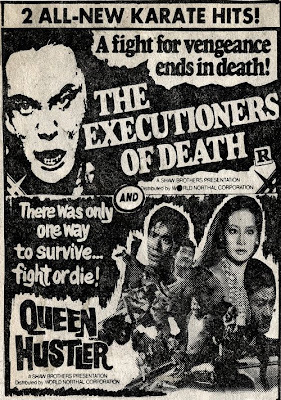 The first and most obvious is the regional release pattern of indepedent movies during the 1970s and '80s, which the ad below nicely illustrates. 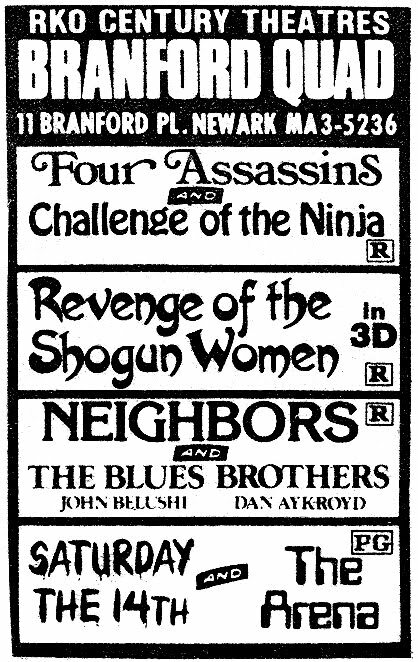 SATURDAY THE 14TH opened in October 1981, NEIGHBORS was a December '81 release, and REVENGE OF THE SHOGUN WOMEN hit theaters in the New York-New Jersey area in January '82, so one would assume that THE FOUR ASSASSINS and CHALLENGE OF THE NINJA were also late 1981 or early '82 releases -- yet World Northal premiered them both in November 1980. The second is the MPAA database. 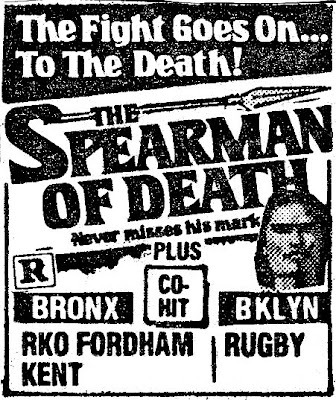 For reasons possibly related to the syndication deals, World Northal would submit their movies to the MPAA months after they opened in New York. For example, THE FIVE DEADLY VENOMS -- which played on 42nd Street in July 1980 -- is one of several World Northal releases from '80 that the MPAA has on file as being submitted in 1981. 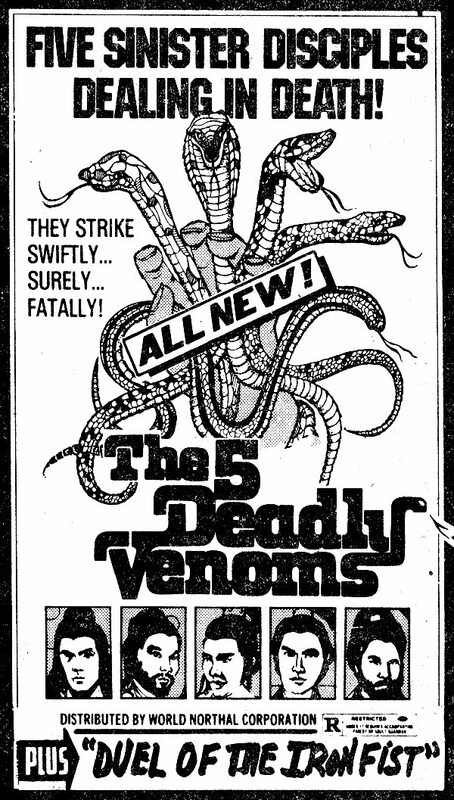 The other source for incorrect information is John Willis' annual Screen World. 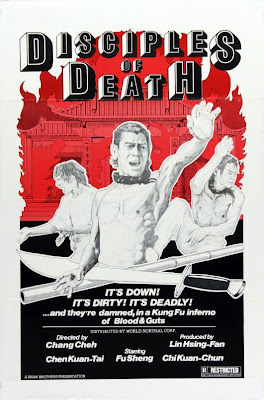 Willis apparently got a lot of his information from Variety and its city-by-city box-office reports; if THE SPEARMAN OF DEATH was drawing big numbers in Cleveland for a week in January 1984 and Willis had no prior data for it, the movie would appear in the following volume of Screen World as a January 1984 release, even though it had been in circulation since 1982. To gather the following information, I consulted the New York Daily News, New York Post, Newsday, Chicago Tribune, and Village Voice movie listings, as well as Boxoffice. 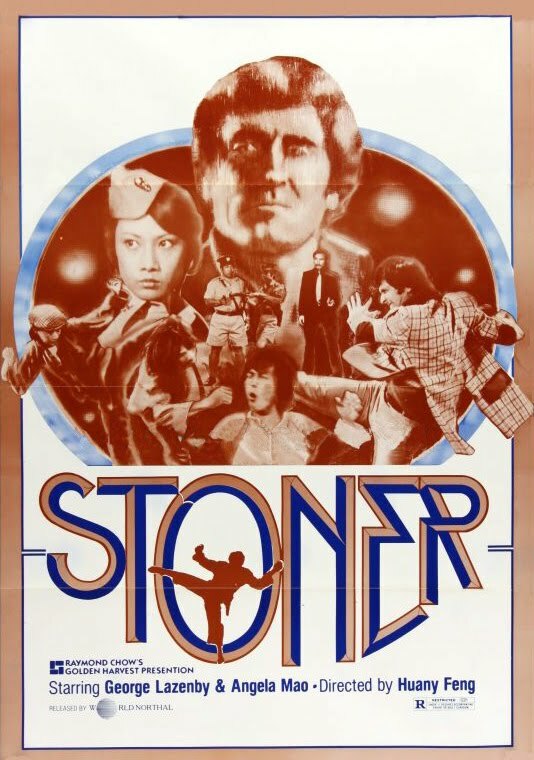 Under the distributor credit, 1976 is given as the World Northal release date. It’s actually 1983. 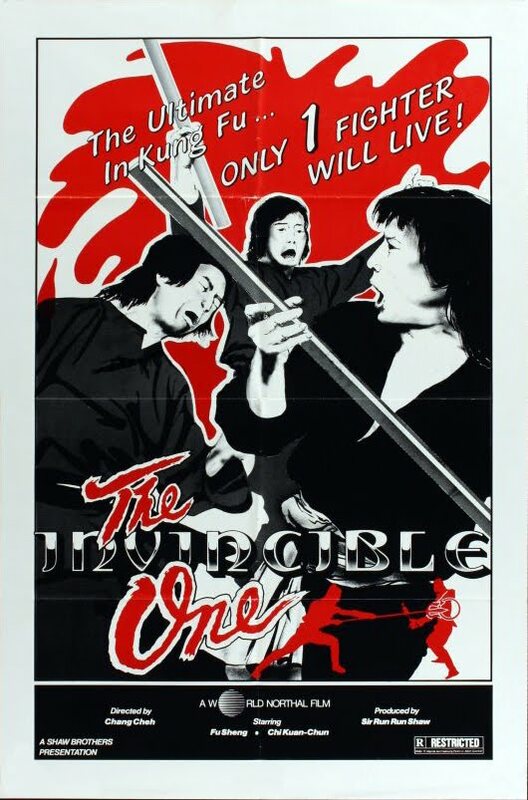 The IMDb lists a U.S. release date of January 1984, but it played in New York in 1983. This date should also be applied to the company credit. In the company credits of the IMDb, New World Pictures is credited with releasing the movie in 1982. 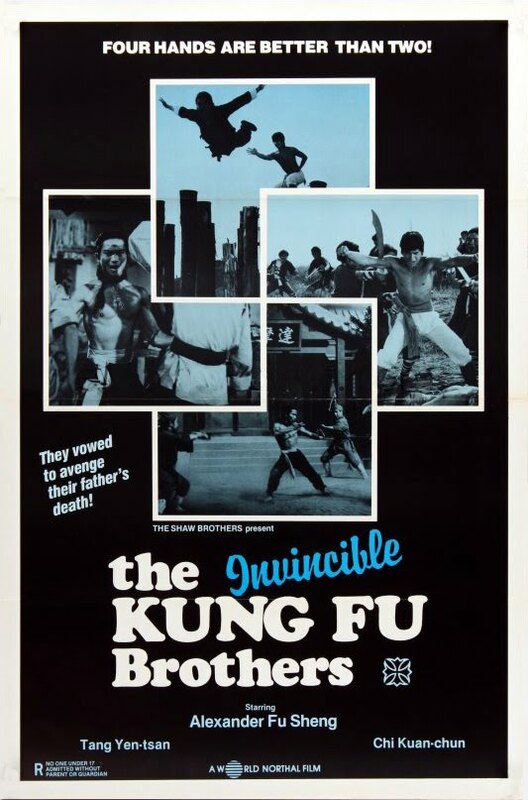 It’s possible their sub-distribution office in Atlanta (New World Pictures of Atlanta) handled it in the ATL territory -- and someone who lived in the area at the time added this information -- but New World didn’t release the movie nationally. 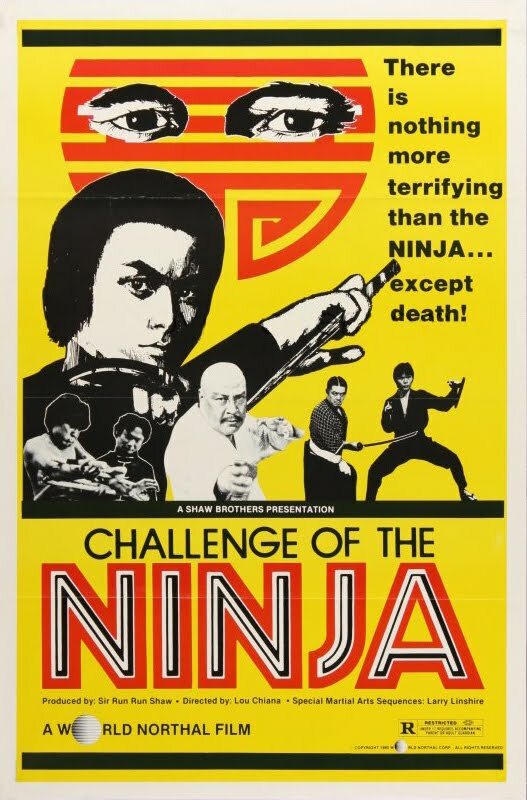 The company credit should be World Northal (1980). 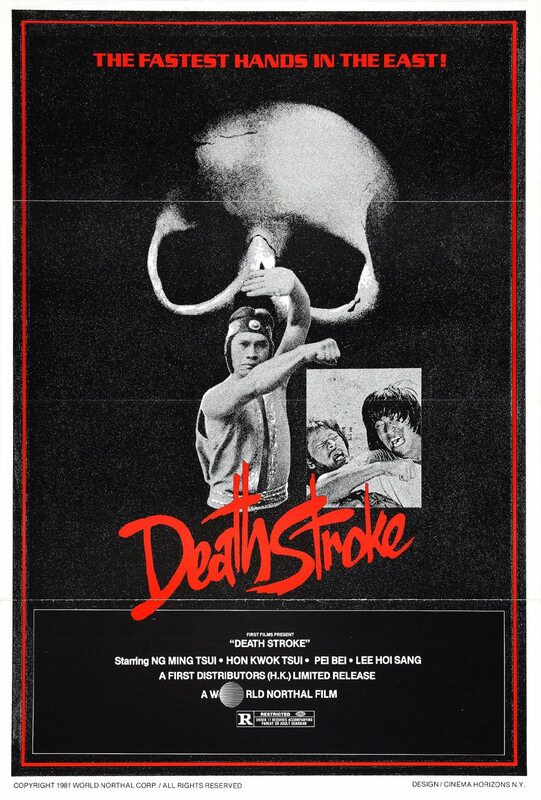 The IMDb lists a U.S. release date of 1983, but it played in New York theaters in 1982. The IMDb lists a U.S. release date of 1981, but it first appeared in New York theaters in July 1980. 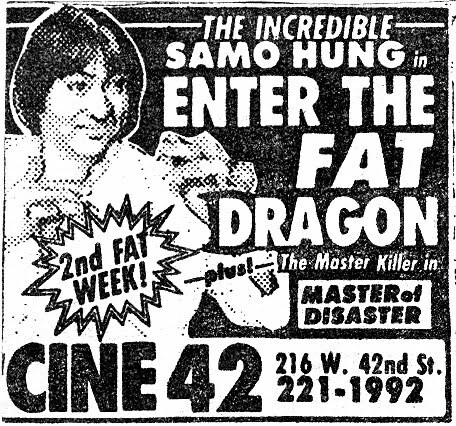 The IMDb lists a U.S. release date of 1981, but it first appeared in New York theaters in November 1980. 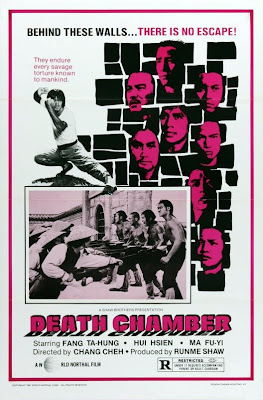 I couldn’t find a U.S. one-sheet or ad for HEROES TWO, but it opened on 42nd Street in June 1984 on a triple bill with DEATH CHAMBER and FIVE MASTERS OF DEATH. 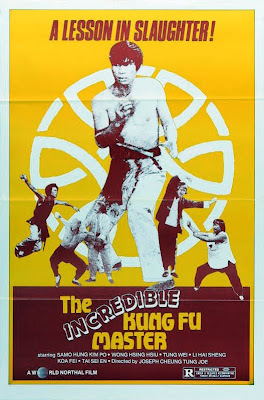 World Northal later changed the title to KUNG FU INVADERS for a TV syndication package. 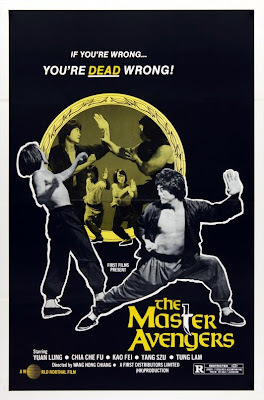 Distributor info is missing and should be added: World Northal (1983). Distributor info is missing and should be added: World Northal (1984). 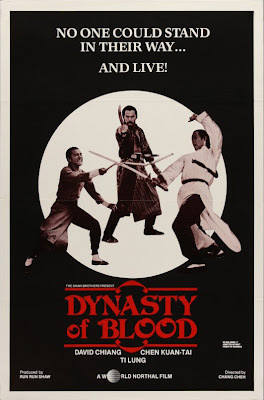 Release date is November 1984. 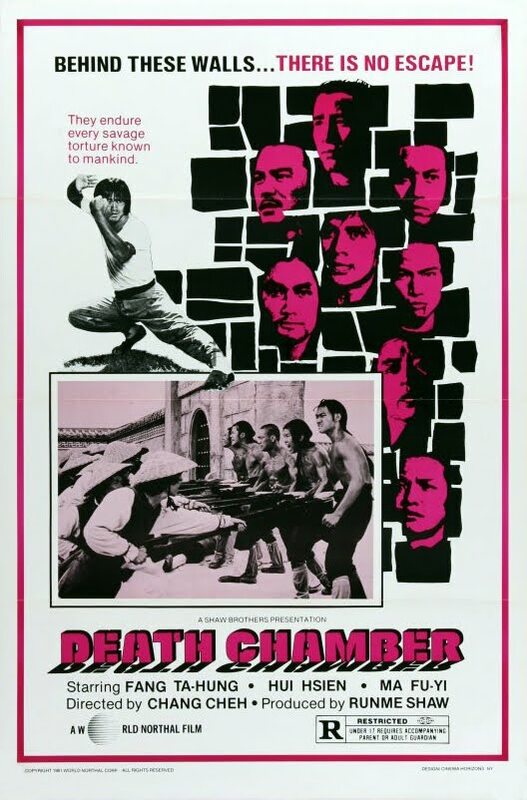 The IMDb lists a U.S. release date of 1981, but it played in New York theaters in 1980. The IMDb lists a U.S. release date of February 1984, but it played in New York theaters in 1982. The IMDb lists a U.S. release date of October 1981, but it played in New York theaters in 1980. 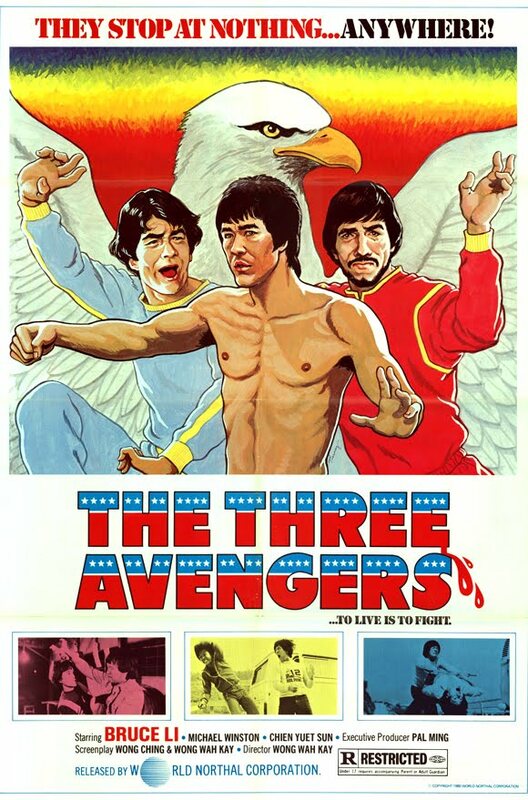 Also, "re-release" needs to be removed; THE THREE AVENGERS and ENTER THREE DRAGONS are two different movies, but the person who last updated the company credits seems to think they're one and the same. Therefore, Cinematic Releasing Corporation (1979) needs to be removed from the company credits, since that applies to ENTER THREE DRAGONS and not THE THREE AVENGERS. 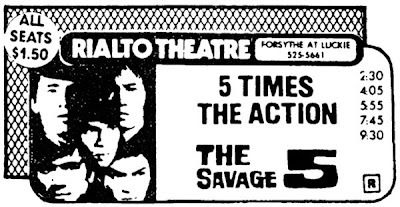 Thanks--especially for the reprints of old newspaper ads: Seeing the names of some of those long-gone theaters really brought on a wave of nostalgia! I don't know if you've ever interviewed Tom Bernard, but he worked at World Northal before joining UA Classics in 1982. Bernard is one of the team behind Sony Pictures Classics. I'm sure he' love to talk about his days at the company. 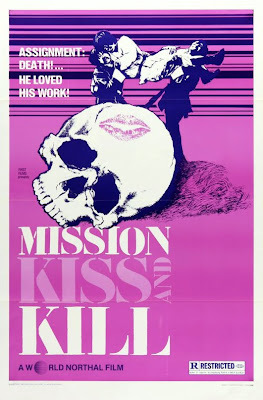 Great post as always and a couple of these posters/ads I hadn't seen before. So World Northal released some of their acquisitions sans a rating then submitted them later? Do you think it's possible this could have been to test a films marketability prior to sending it off to get a rating? 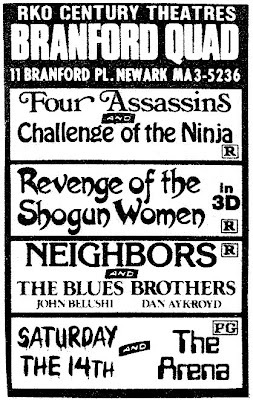 The trailers I've seen for most all of these had an R rating on them, which was baffling in some cases such as CHALLENGE OF THE NINJA. 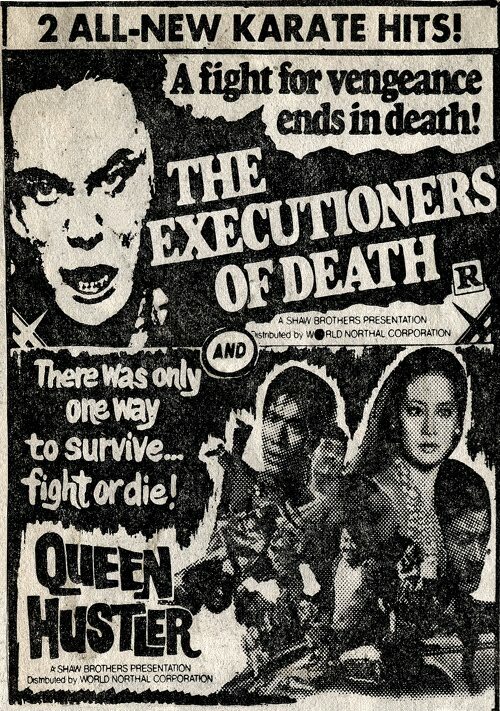 Nobody even dies in that movie, lol. 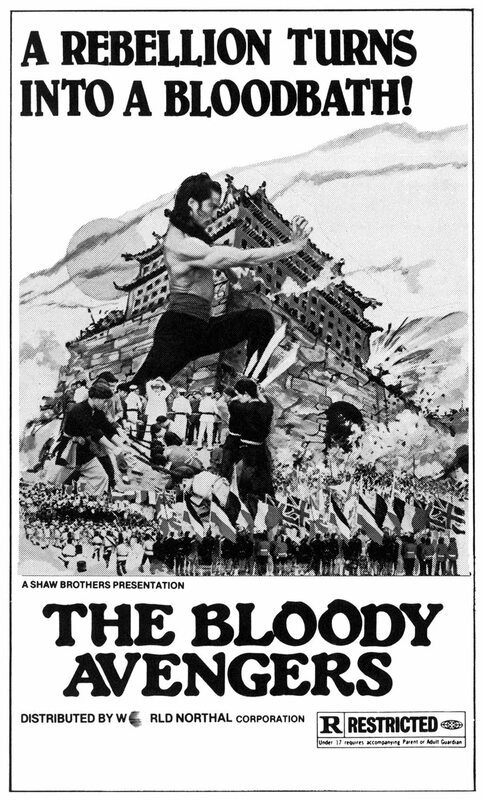 I have often wondered how the MPAA handled the plethora of foreign films like these since there were so many of them pouring in back in the day, not counting the breadth of home grown product. Regarding Larry Bensky, I do recall seeing Liu Chia Liang's SHAOLIN MANTIS on television under the DEADLY MANTIS moniker and it being 'Edited By Jerry Koenig'. It's the only Shaw picture I recall seeing on TV with an editing credit by someone other than Larry Bensky. Some additional info regarding BOXER REBELLION. 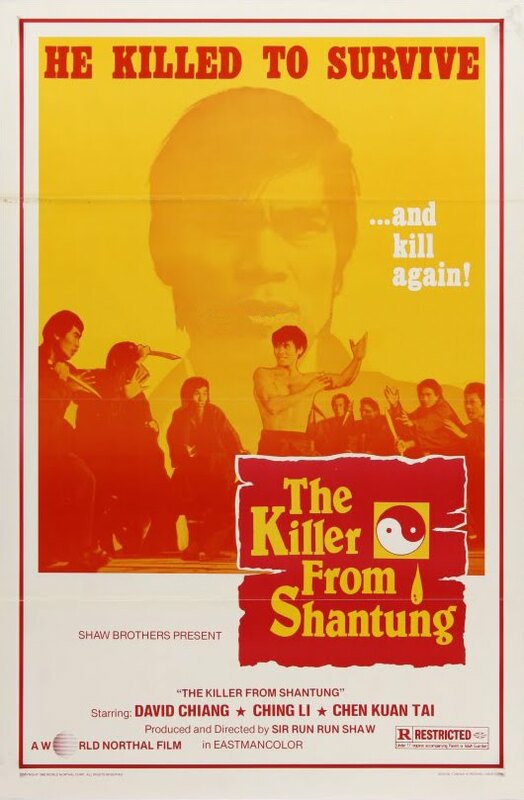 Not sure it's even pertinent, but the film ran into a ton of trouble back then in its homeland. 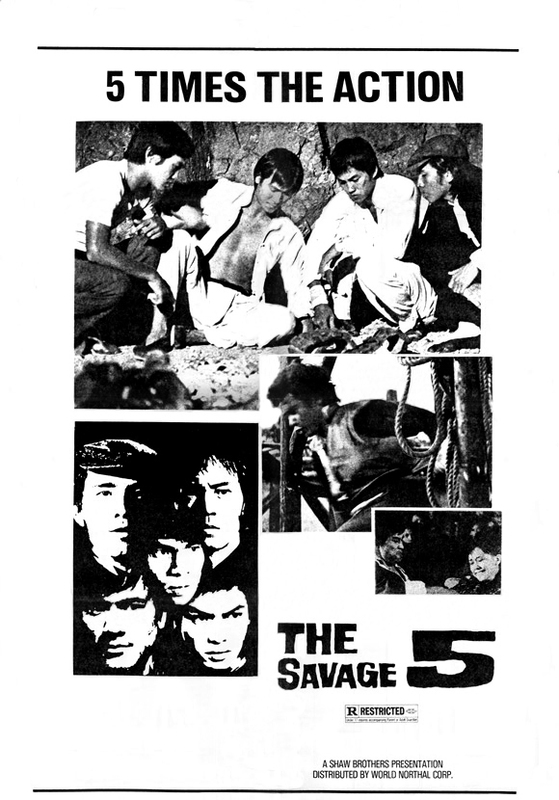 It was initially banned in HK, had chunks of footage cut out and suffered a title change to SPIRITUAL FISTS. It suffered a similar fate in Taiwan. I didn't know if HEROES TWO ever played in theaters here or not, or what title. 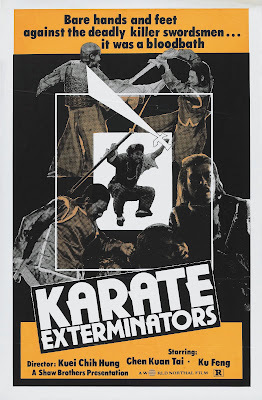 I always saw it on TV under that KUNG FU INVADERS title. 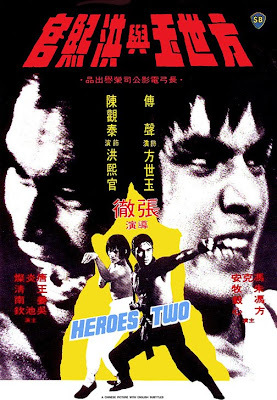 Same deal with HEROIC ONES. 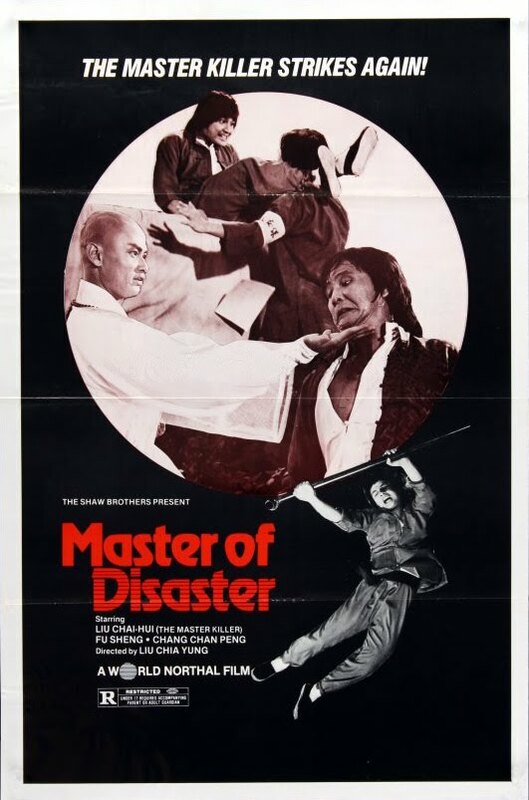 It was saddled with the odd title of SHAOLIN MASTERS of all things. Wow. 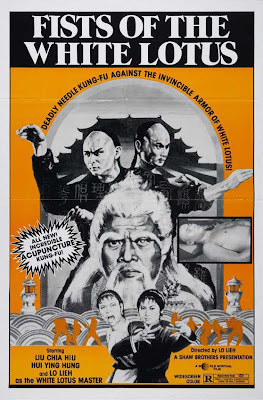 That's bizarre the INCREDIBLE KUNG FU MASTER poster uses a shot of Chen Kuan Tai from BOXER FROM SHANTUNG as its main selling point, and it's mostly a comedy! KILLER CONSTABLE was released in HK in March of 1980. 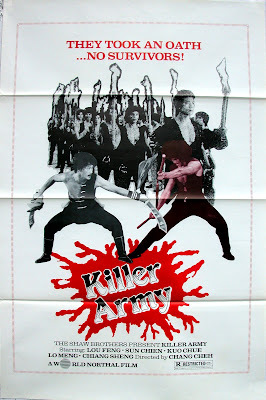 Production lasted throughout 1979 and it was released in early 1980. 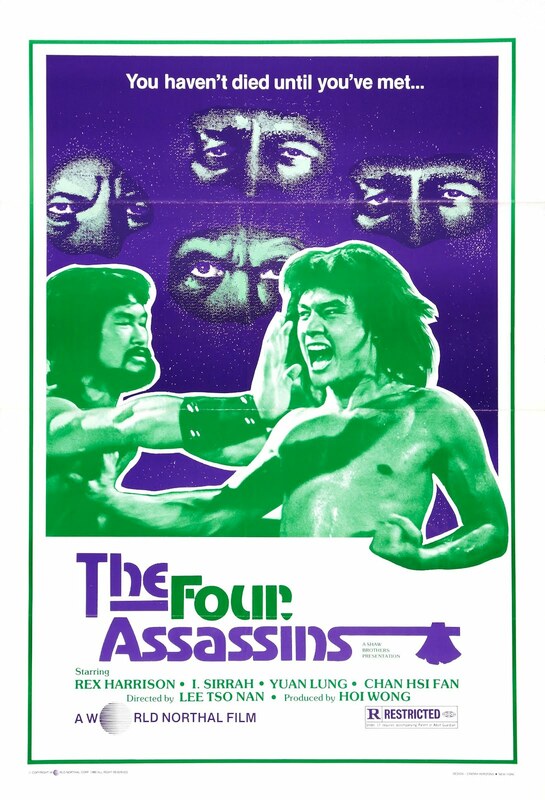 Unfortunately, all of Kuei's efforts resulted in a lukewarm response at the box office over there; which was even more disappointing in that it was heavily hyped and promoted in Shaw's promotional mags at the time. It's actually a reworking of Chang Cheh's INVINCIBLE FIST from 1969 starring Lo Lieh. 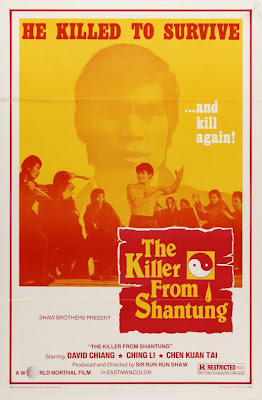 There was also a note for note rip-off of CONSTABLE called DEMON STRIKE that has a production date of 1979 (where promotional materials appear from, but completed film looks like it might have been later) that featured Pai Piao (who was a villain in CONSTABLE) playing the role Chen plays in the Shaw picture! 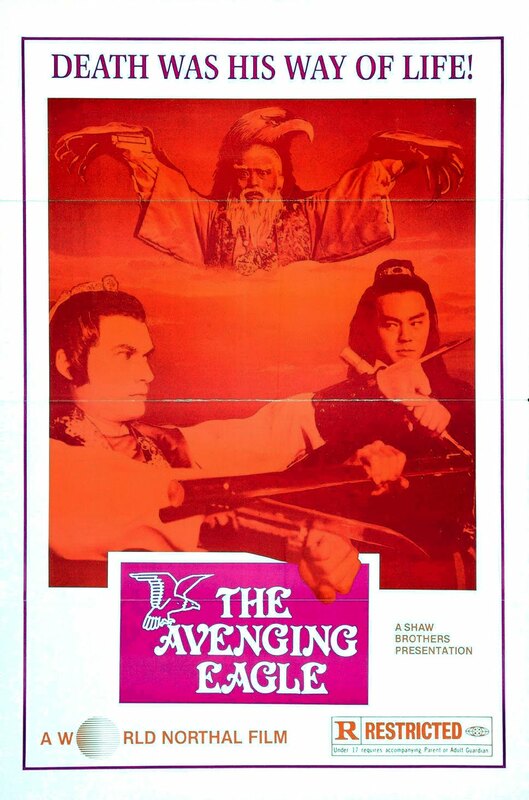 The film differentiates itself by having Hwang Jang Lee in a subplot as some black magic wizard who shoots lasers into women's extremities, then consuming the bad optical effects that shoot back out of them. 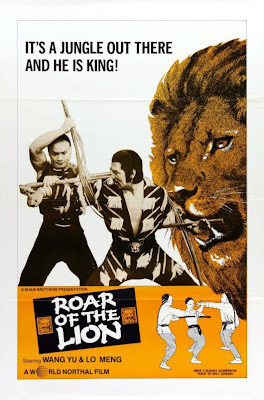 The ROAR OF THE LION poster is of special interest in that the shot of Lo Mang and Wang Lung Wei isn't even in the finished movie. I'm curious about FLAG OF IRON. 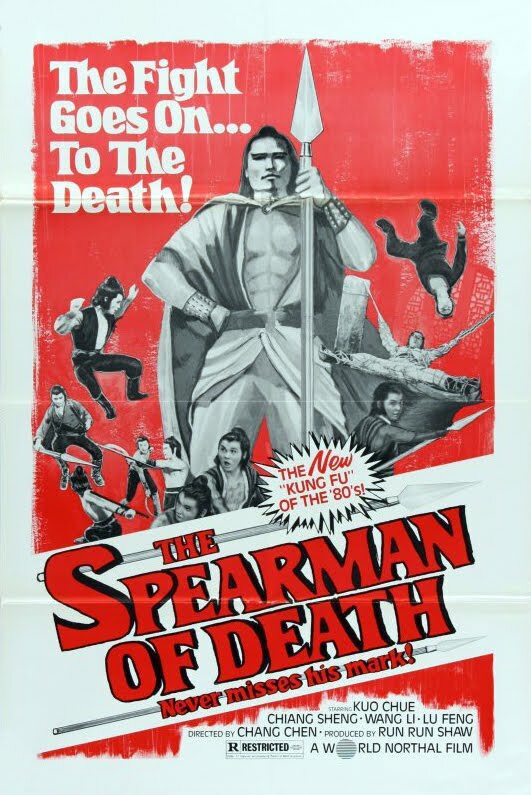 The trailer for it lists it simply as SPEARMAN. 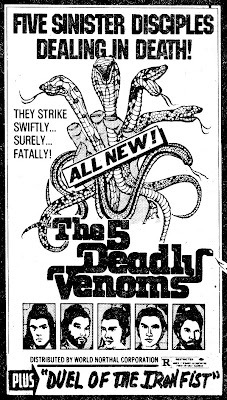 Did somebody else handle it prior to World Northal, or did they release it under that title, too? 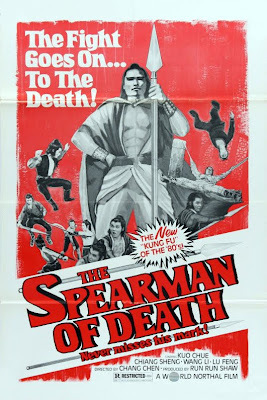 If I remember right, the TV title was plural, SPEARMEN OF DEATH. I wish I still had that tape to confirm. @Ivan: You're welcome! And thank YOU for the nice comment about the post. Great article! Some of these films still turn up time to time on TV on Fuel's Late Night Kung Fu show.